Tencent launched the WeChat Mini programs earlier this year and took the market by storm. So what are these mini programs and how can you use it?This blog will give you all that you need to know about WeChat’s interesting feature. These mini programs are essentially sub applications/apps within WeChat itself. The user can make use of these features without having to actually download or install them. How exciting! Thousands of mini programs have already been launched where you can order food, watch videos, book tickets for movies, book cabs or even shop online! And this is just the beginning, the mini programs feature looks more promising by the minute. 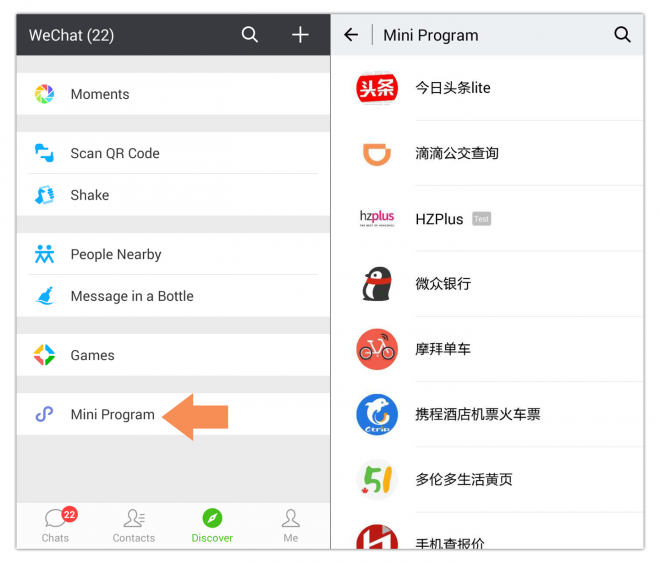 So what are the things that make mini programs a great addition to WeChat? There are 3 different ways to get the WeChat Mini Programs and they are incredibly easy! Finding these apps do not involve any extra effort and the sheer simplicity of this process makes Mini programs extremely user-friendly. And if you like an app, you can easily share them with your friends and get them to use to it too! Wechat articles requires the user to exit the article if they want to chat with someone. But mini programs does not possess this problem.The users can pin the app on their Chats page by selecting “Display on Top”. Then they can re-enter the app whenever they want.This is a huge plus point for the app. Based on the update in March, individual developers can add their products to Mini programs. This open platform approach encourages more people to innovate and create new apps on the program. Do you have any favourite apps from this feature? Let us know in the comments below!